Here it is...round 3 of the Biggest Loser! This week got a bit tougher, we had to use 6 of the 8 scrappy items on the list. AND add some kind of stitching. Here is what I used: Cardstock/Patterned Paper/Scraps, 3 buttons, stamping, embossing, stitching, paint, and a punch. And I had to hand stitch, because no sewing machine for me. I used an acrylic butterfly, stamped a flourish with versamark and embossed with silver embossing powder. I haven't pulled my heat gun out in a while! I also did some hand stitching on my felt hearts. I'm definitely having fun using lots of my stash that I forgot I had. I am almost over being sick and looking forward to my race this weekend!! It's the Surf City Half Marathon. I'm hoping to hook up with my online scrapping buddy Joni, as she and her son are both running the race. I'll look for you in the beer garden at the finish line!! Full reveal in just a few short days, you are all going to love this kit! I was sick yesterday and today. NOT a good week for that, i'm running my half marathon this Sunday so I hope i'm better by then!!! Hope you are all doing great, Happy Wednesday!! I went on a scrapping retreat back in December and in the chaos that is December, I forgot to share some of them!! It was a crazy time of year to leave for a weekend, but once I was there it was pure relaxation. I actually got quite a bit accomplished. So, i'll share with you all!! I love this pic of my sister and BIL with my daughter. They have so much fun together!! And BTW, THANKS Sarah for all the great scrapping stuff you sent the kids! They are in heaven!!! I finally used some Pink Paislee papers I had been hoarding!! I love this pic of my mom and daughter. They are quite the pair!! I stickled the heart O after painting the chipboard. Added some bling!! And here is a real simple layout of my BIL who introduced us to geocaching!!! So much fun that I bought my husband a GPS for Christmas and we are now finding treasures all over town. I've got more and will try to share later. Going to watch the last couple episodes of The Office, season 4. I LOVE that show!!! It's just so damn funny. Have a good night! I received a new cake book for Christmas. It's called The Cake Book by Tish Boyles. It is the kind of cookbook I can read from cover to cover, it has so many great recipes!! Traditional cakes, cheesecakes, mousse cakes, ice cream cakes and all sorts of recipes for frostings and garnishes and toppings. This is my first recipe from the book, White Chocolate Cheesecake with Peaches. Did you see the peaches??? Well, I couldn't find any in the store! So I decided to go for a dab of buttercream frosting topped with a marachino cherry at regular intervals. We are getting together with friends for dinner tonight so i'm bringing this for dessert. I've stopped just making desserts at home for no reason, because I end up eating them all. So I like to have a special occasion before I make anything. Sometimes I invite total strangers over for dinner JUST so I can make dessert! Ha, just kidding, but the thought has crossed my mind a few times. This is only my second cheesecake and my first attempt was a total disaster. I sure hope it tastes okay!! Hurrah! Friday is here! I finally finished my second challenge in the Biggest Loser (Lose Your Stash!!) challenge at Scrapbook Deals 4 U. This week the requirements were to use at least 5 of the following: paint, transparencies, flowers, 3 colors of cardstock, striped paper, fiber and eyelets. And the bonus item was doodling!!! Here is what I came up with. The striped paper is Basic Grey from the Offbeat collection. Love that paper!! That's about all I got today!! I am going to be early tonight, it's been a long week. Hope you all had a great week!! Dang, this week is going by so slowly. Work has been busy, my daughter has been a piece of work this week and it's only Wednesday! Here's looking for the weekend already! But I wanted to share this little gift that I made for a group of scrappy girlfriends of mine a while ago. We try to get together and scrap when we can and there was one Saturday that I could not make it. So I decided to doorbell ditch them (nice way to introduce my kids to the dark side) with a bag full of goodies and a cheap bottle of wine. They don't like the expensive stuff, hee hee!! So I dressed up a plain kraft colored bag, make a wine gift tag and put it all together! Let me explain. We call ourselves the WestSide Tote Bag Gang because we all have the exact same scrapping tote. And since we are so ghetto, we shortened the name to just Westside. And we all think it's REALLY funny and like to throw gang signs when passing each other in the school pick-up line and at the grocery store. The skull stamp from Pink Paislee was just perfect for this, how cute is that little bow???? My kids and I had alot of fun leaving this on the doorstep, ringing the doorbell, and then running. Until I tripped on the sprinklers and almost took my kids down with me. And then we sorta got caught by the neighbors, but that's a whole other story. Thanks for stopping by! Hope you're having a great week so far!! My scrappy friend and fellow DT member Sarah gave me this blog award!! Isn't that cool?? Thanks, Sarah! You should totally check out Sarah's blog. She makes beautiful pages and has cutie pie kids AND a homebrewing husband! 5. Rock of Love TV!! And the fun part...passing along the Fabby Blog award!! Hope you are all having a great Monday!!! Wow, what a beautiful weekend! It's been 75 degrees and sunny and just a bit windy this weekend. Perfect for spending it outside. I took the kids out yesterday morning to a local park and had a little photo shoot. I borrowed a bunch of cute dresses from a friend for Kayla to change into (she is SO into that sort of thing!!) and Kevin brought his favorite baseball hat and a few shirts to change into. We had a great morning just playing and messing around with my camera. Here are a few of my favorite shots. The kids actually had alot of fun and Kevin was directing me all over the park deciding where he wanted his photo taken. Too funny!! Then we met Craig's family for dinner to celebrate my FIL's birthday. Lots of fun and a few too many martinis. Woah, that long run this morning was a bit tougher than it should have been!! I also finished this challenge over at Moments 2 Remember. Ching challenged us to make a paper cupcake and here is what I ended up with. It was alot harder than I had anticipated. The folding of the cupcake holder was giving me fits until I tried a thin piece of paper (I started with Bazzill), that worked much better. It's a big messy around the edges, but I still like it!! See that sentiment stamp? It's from a stamp set by Papertrey Inks. I am really starting to love their stamps, they have fantastic acrylic stamps. I just ordered a few more sets from the new release and can't wait to get them!! They have a fantastic gallery with all sorts of fun ideas!! So, I also made a matching card for the cupcake. This paper is from Close To My Heart and i've had it for a while. Always loved it and now i'm just using up the scraps. The paper was too pretty to throw away the scraps!! So now I have a cute little birthday set that will be for somebody special!! Thanks for stopping by and hope you're having a great weekend!! 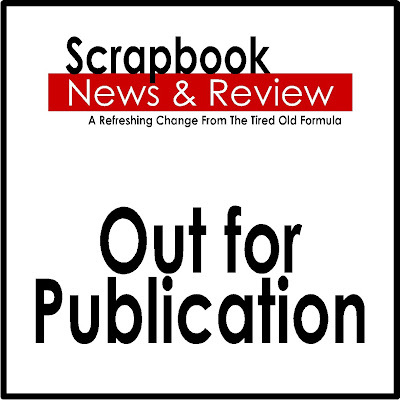 I'm participating in a contest over at Scrapbooks Deals 4 U called The Biggest (Scrap) Loser. It's a fun contest to lose your stash!!! We are supposed to use everything from our stash and each week is a new challenge. This is my week #1 entry. The challenge was to create a 1-page layout and use at least 4 of the following items: brads, buttons, ribbon, ink, number stickers, stickles, or 5 pieces of patterned paper. You also had to use at least 3 photos. And here is my entry! I used 5 pieces of patterned paper, ribbon, ink, buttons and stickles!! The paper is by Cherry Arte and was in a kit I bought sometime last year. Felt good to open it and play a little bit!! And while I was at it, I also made 2 cards. WooHoo!! Thanks for stopping by! I hope to using up more of my stash next week!! So a while ago I sent in my application for the My Acrylic Album design team call. I didn't make the team...BUT I did get asked to be the Guest Designer for May! YEAH!! I was so excited to get that email!! I have no idea what they are going to send me to play with but I am really excited to get it. WooHoo!!! Here are a few projects I sent in for my application. I am seriously tickled pink that they picked me!!!!!!! My daughter thinks she's a supermodel!!! She was trying on new clothes after Christmas and seriously starting strutting her stuff like she was on the runway. Now, I did NOT tell her to do this. Or to put her hand on her hip. Or to look over her shoulder. She just 'knew' what to do. Should I be afraid??? LOL!!! The hardest thing to find was the sugar free vanilla syrup. I ended up locating some at Target, it isn't the brand she suggested but it's the same thing. You could probably find some at Beverages 'N' More, but I didn't have time to look there. I also ordered the green tea powder from Teavana and it was a bit pricey. But well worth it!! Her tip is to dissolve the powdered creamer in a bit of hot water before adding it to the blender. I made this Green tea frapp this afternoon and it did NOT disappoint! It seriously tasted like the real thing!!! I ended up adding a bit more milk because it wasn't blending up that nicely. But it only added about 15 more calories, so well worth it. I think maybe a bit less ice would also solve this blendability problem. This drink is fantastic, delicious and I will absolutely be making it again!! Yeah for Hungry Girl! This month's kit from Color Me Daisy is full of paper from Pink Paislee's Sweet Cakes line and paper from My Mind's Eye. Lots of great colors and cupcakes, plus sheer cupcake ribbon from Maya Road, Maya Road felt flowers, a great little butterfly and flourish stamp from MME, rubons, ricrac, AND a chipboard cupcake album from Maya Road!! What a great kit! 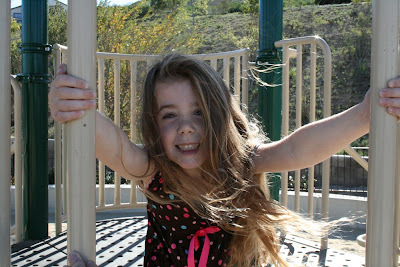 I love this photo of my daughter on her 5th birthday. I love taking self portraits of my hubbie and I. He doesn't exactly LOVE it, but he always tolerates it, at least! I added some stickles to the butterflies and the top of that big fun cupcake! Here are some of my daughter's favorite friends from Kindergarten! I cut the flowers and leaf on the cricut and added some Stickles. And I had lots of fun playing with my new Cricut cartridges for these cards! Thanks for looking!!! 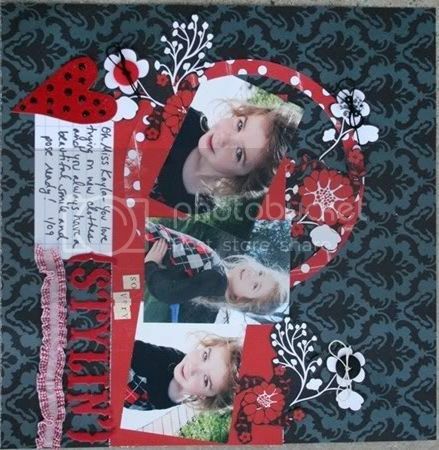 This kit was alot of fun to work with and I'm still playing with my Cupcake chipboard mini album. I'll share that when I'm finished!!! Moments 2 Remember January Reveal! !